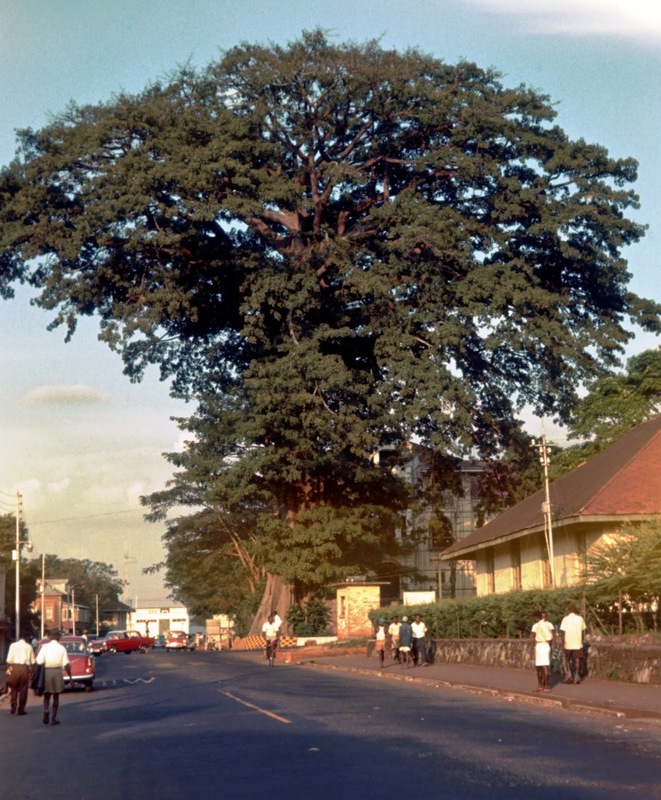 On Wednesday I wrote a post on Facebook about the Freetown, Sierra Leone cotton tree. Situated in the center of the city, freed slaves met under the trees' branches in 1792 to lay the foundations of their new nation and society. (Here's my 1960 photo of the tree.) The tree is still alive and well even though many Sierra Leoneans have died in the Ebola epidemic, along with others in nearby nations. In my Facebook post, I wondered what gift, if any, the people of Sierra Leone would find under the cotton tree as people of other nations find gifts under their Christmas trees. They need a Christmas gift. In Freetown, all Christmas gatherings were cancelled by law to avoid the spread of Ebola. Today, Dec. 26, I received an answer. Dr. Lowell Gess will come out of retirement and return to Sierra Leone to help medical staff in the United Methodist Hospital there deal with the Ebola epidemic. I want to share the e-letter I received. The letter was written by Melanie and Roger Reiners of North Dakota, volunteers in the Sierra Leone support program of the church. I received it as a member of the Servants of Sierra Leone. "Yes, Lowell is going to Sierra Leone ALONE! Roger offered to accompany him, but he says, "No, you kids are way too young. I won't allow it." He plans to leave on January 3 and stay for three months, returning near the end of March. He just wants to go and spend time there helping and encouraging the staff. He will do some training for them and just encourage them in general as the program picks up again when an end comes for Ebola. He has told us so many times that if something should happen to him while he is there, we are not to bring him home to Minnesota because Sierra Leone is home, too. He desires to be buried at Rotifunk [a town beloved to UMCs.] We have told him that the selfish part of us wants to beg him to stay here with us; but, we know that wouldn't be right as he is just following his call. He has, over the last year, many times said, "I can't be sitting around here leading Bible studies and visiting in the nursing homes. I need to be doing something for Sierra Leone." All we can say is, "We love you and Godspeed." These are a few facts about Dr. Lowell Gess. Born in Paynesville, MN, his career includes graduation from Evangelical Theological Seminary (now Garrett-Evangelical Theological Seminary] and medical school. He and Ruth, his wife, served as Evangelical/EUB/UMC medical missionaries in both Nigeria and Sierra Leone. In the latter they served for two decades. Sierra Leoneans in the church and medical communities in the country already know him well and will greet him with open arms. Lowell is the gift under the cotton tree for all of Sierra Leone in Christmastide, 2014-15. God bless Lowell and all West Africans. P.S. You can read more of this story at this link. And, if you appreciate the story and Sierra Leone's servant, Dr. Gess, share the story on line with your friends.